A traditional Irish music session is never far away in Ireland, because virtually every pub on the emerald island, no matter where it is, can suddenly and without warning be a host to what is known as a “session”. Local musicians will just crack open fiddles, tin whistles and guitars and will seamlessly become the backing soundtrack to great jokes, stories and good craic (meaning ‘fun’). So here is some of the best 3 places in Ireland to catch a traditional Irish session. You know Darkey Kelly’s is something pretty special just by looking at where it got this name from: A woman in Dublin, called Dorcas “Darkey” Kelly – who in the 18th century was accused of being a witch and a serial killer when dead bodies were found under the brothel she ran! Subsequently she was burnt at the stake in 1761. Darkey Kelly’s is an eccentric pub with some interesting cocktails such as Poitin and bitters, as well as plenty of Irish craft beer, and of course, Guinness. It frequently has live acoustic acts in the late afternoon into the evening, which attracts musicians and visitors from all over the world, but traditional Irish sessions always appear shortly after the acoustic sessions have finished and the sessions will continue until close. The best time to visit is usually on Friday evenings or Saturdays when most Dubliners will be off work for the weekend, making the place atmospheric and fun, with a bonus being that it is short way away from the expensive Temple Bar district, and so drinks here are much more reasonably priced. Connemara is arguably the most beautiful region in all of Ireland. With it’s incredible mountains, a Fjord and it’s vast marshlands which seem to be covered in a constant mist, Connemara looks like something out of fantasy worlds, such as Lord of the Rings. Clifden is a small, charming town with a spectacular mountain backdrop right in the heart of Connemara, where Irish is still widely spoken as the first language! So, it may come as no surprise that Lowry’s pub has retained it’s Irish authenticity despite being a tourist hub in the summer months. You will meet friendly Irish folk at (and behind!) the bar, always ready to share a raucous a joke or two! Lowry’s also offers over 100 whiskeys and numerous Irish craft beers to sample, along with 7 nights a week trad sessions which helped it win the coveted ‘Best Tradition Bar in Ireland” award in 2015. It’s famous all over Connemara for it’s breath-taking scenery and Irish culture which conjures up the perfect atmosphere for traditional session music. Finally for something a little different, the Lee Sessions in the city of Cork refer to session music that has been playing non-stop constantly since 2011 by different trad musicians in numerous different pubs all over Cork! This probably sets a world record on continuous and unbroken trad sessions played in a single city. 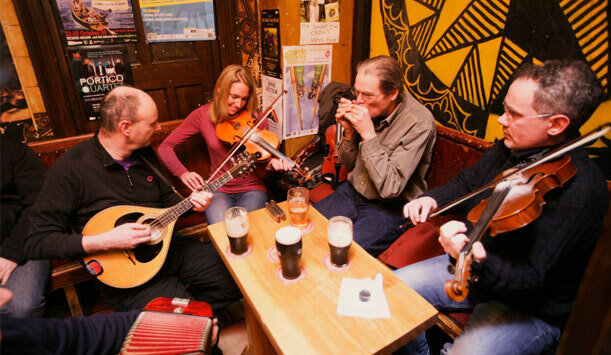 Cork is also home to the most prestiges traditional music schools in Ireland, and also has one of the highest densities of pub concentrations in the world, so you can easily combine a pub crawl to line up with some of the trad sessions. So hopefully this gives a short guide to the most atmospheric places to catch trad sessions on your visit to Ireland! With some fantastic car insurance offered by Chill Insurance as well, you can rest easy knowing that you’re well covered on any jaunt to the tiny, welcoming villages and towns that these great trad sessions pop up in. Next stop – Ireland!